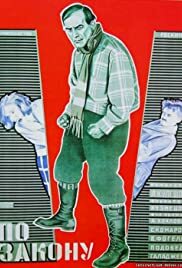 If there was a specific characteristic among the Russian films after the Bolshevik's advent to power, it was a special care about film aesthetics circumscribed in propaganda; avant-garde films that perfectly combined a political message with fascinating imagery. However sometimes Bolshevik films deviated from that norm thanks to the mastery and inventiveness of their directors. That certainly happens with "Po Zakonu" ( By The Law ), an astounding and brilliant cinematographic exercise directed by Herr Lev Kuleshov in the silent year of 1926. Herr Kuleshov's film theories play an important part in the success of the film. The film tells the story of five gold prospectors on the banks of the Yukon River trapped during a terrible winter and is an adaptation of Herr Jack London's story "The Unexpected". With minimal sets and cast ( this was a personal challenge for Herr Kuleshov, the claim that it is possible to accomplish a great film with few resources ) "Po Zakonu" is a remarkable and disturbing masterpiece. Fascinating shots of a wild environment ( nature is a main and decisive character in the film ) emphasize the claustrophobic atmosphere that drives the characters to desperation in their solitude (one of them shoots two other members of the crew). The film is also a disturbing physiological study wherein every gesture and facial expression is studied as well as the impressive Russian body language. Here the avant-garde technique is in the service of a nightmarish atmosphere and tense drama. And now, if you'll allow me, I must temporarily take my leave because this German Count must dig for gold in one of his Teutonic heiresses' private rooms.